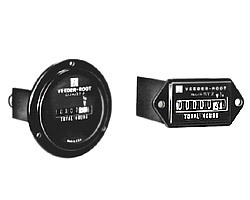 Veeder-Root 7795 Hour Meters | Ohio Belting & Transmission Co.
Ruggedness and reliability are featured in the Series 7795 electric hour meters. One-tenth hour resolution, round or rectangular package and cutout styles and a choice of DC or AC inputs allow its use on construction machinery or leased equipment to determine usage, maintenance, and warranty periods. The hour meters are easy to install, durable and shock resistant. The 7795 series is also compact, which means it only requires a small panel cutout. It is light weight which is nice for use on protable equipment. The hour meters are also sealed against dirt and moisture, as well as tamper-proof and non-resettable. Most importantly, the figures on the hour meter are extremely easy to read.